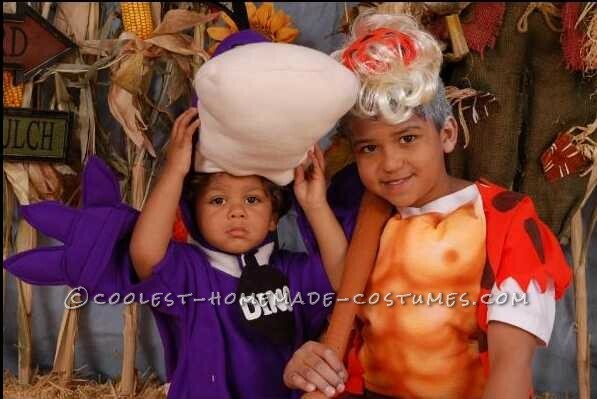 Since our first son was born I have always made our costumes. The more kids we have the more fun it is getting. 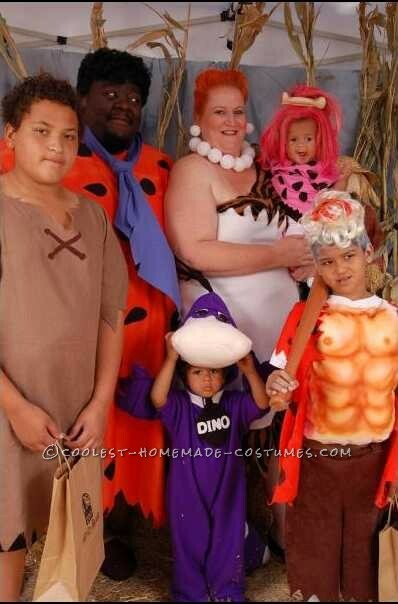 This year we decided to do a Flintstones family costume. It took me about 5 months of planning, sewing, airbrushing, hot gluing and painting to make all of the costumes. You can’t see it in the photo but we have an expedition that we also decorated like the Flintstones Mobile by taking foam swimming pool noodles and covering them with wood print contact paper and putting them along the running boards and hot gluing the peg to the center of the hubcap to split in the front and back, then added the cloth over the top. My husband, Gene, is Fred. His costume is always a challenge since he is 6’3” and 500+ pounds. My name is Rebecca and I am Wilma. Our oldest son Terrell (11) is Barney, you can’t see her in the photo but we made a mannequin up to be Betty so he can carry her when we go out. Travon (8) is Bam-Bam, we sewed stuffing inside the t-shirt and airbrushed the muscles. Kaylee (1) is Pebbles. Brennen (3) is Dino, this was one of the more challenging costumes since it had so much detail. I started with a pair of his footed sleeper pajamas so that it would be easy to get on and off and sewed the costume around it. The head is stuffed with cotton so it would not be to heavy. Everyone that has seen us all dressed up together has taken our photo to share and show all of their friends and family members. Our hope is that we will encourage anyone and everyone to just think of an item or person or place and look at photos of that and use your imagination to make the costume come to life! Everyone has an imagination some of us just forgot we had it… Halloween is the perfect time to find it again!